The all time favourite available for you to have in your home. Challenge all your friends as you drive late into the night. 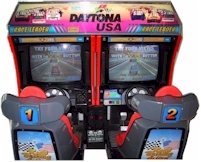 Our Daytonas are a twin sit down version and are serviced on a regular basis. Price reduction if more than one is hired. The most popular game at the moment is Big Buck Hunter. Cost $200.00 Plus Delivery. Another popular video game at the moment is the "PGA Golf" games. Using a trackball system up to four people can play at once. You can also hire Dance Machines for $300 plus delivery. Fighting Games ie. Street Fighter etc. Please ask about other games as I've only listed the more popular games. Pinball games from Adelaide Jukebox Hire are very popular and can keep you entertained for hours. A very successful piece to have at a party no matter what the age. Other Pinballs available on request. Hire Cost: $110 plus delivery. For 2 to 8 players a soccer table is great fun and is always competitive. Hire Cost : $180.00 plus delivery. Adelaide Jukebox Hire supplies full size air hockey tables with overhead scoring as you see in the arcade centres. Hire Cost : $110.00 plus delivery. 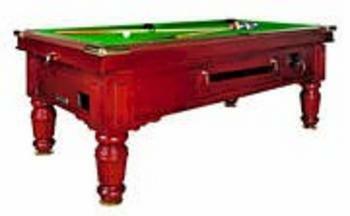 Adelaide Juke Box Hire supplies 7' X 3'6" pool tables with all accessories. We can also do an 8' x 4' slate top table for $200 plus delivery. Copyright © 2008 Adelaide Jukebox Hire. Website by Bakas IT Solutions.